FoodtoEat About Us We’re using the power of awesome food to support two local communities: Your Office “Laughter is brightest in the place where food is” – Irish Proverb Food is about much more than just sustenance. Shared team meals foster better work cultures, making your office happier and more productive. Food is the fuel that powers your people, and we pride ourselves in bringing you the highest quality, locally prepared choices to keep your office moving. From team meals of 5 to client events of 500, FoodtoEat is your dedicated partner for all your office food needs. Local Food Vendors New York City is a global food capital. Thousands of small entrepreneurs depend on serving delicious food for their livelihoods. FoodtoEat’s mission is to help them build more sustainable, longer-lasting businesses by sharing their passion for making incredible food. By expanding their reach beyond the walls of their restaurant or the boundaries of their delivery zone, we help many of these immigrant and women-owned businesses thrive. El Rey Del Sabor is a small taco cart on 60th Street in Midtown. Though New York City often gets blamed for its subpar Mexican food, I decided to test these rumors and try some signature tacos from this authentic cart. I sampled a beef taco and an al pastor taco, both drenched with hot sauce as I requested. For those that are not familiar with al pastor, it is traditional marinated pork, cooked in a similar style to shawarma. The al pastor I have had in California has been excellent, and I had understandably high expectations for this as well. Sadly the al pastor underwhelmed me, the meat was drier than I anticipated and didn’t have that dynamic taste I had come to expect. The tacos had a good amount of cilantro, salsa and hot sauce, but the meat and tortillas could definitely have been improved upon. I felt similarly about the beef taco; not a bad taco by any means, but with some improvements in the meat preparation and tortilla selection, these could have been extraordinary tacos. The salsa was flavorful, hot sauce delicious and proportions just right for a $3 taco, but the tortilla was thick and bland. I’ve heard of taco makers recently investing more time and energy into tortilla preparation, which is one avenue El Rey Del Sabor may want to investigate. Tortillas are often overlooked for the innards of the taco, but they really are just as important. Overall, these weren’t bad tacos for New York at all, but did little to improve New York’s taco reputation in comparison to those that are closer to the border. To order from El Rey del Sabor, click here. I had been looking forward to eating at Uncle Gussy’s for some time, mostly because of the luscious description of their tzatziki sauce, made by the truck owners’ very own mother. In fact the website goes into great detail about their family’s longtime stake in the food industry; so armed with this knowledge I prepared myself for some excellent Greek food. The food was moderately priced, ranging from $4-$7 and featuring pitas, salads and rice platters. 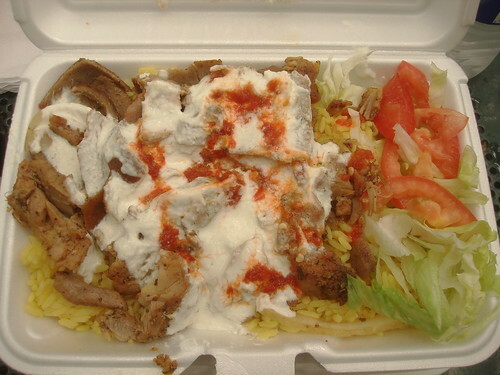 I opted for the lamb gyro rice platter, less messy than a pita. The owners were very friendly, the wait not too long (I beat the lunch rush) and the truck itself seemed extremely clean. I received a generous portion of lamb and rice. In the corner was a small salad, and I received two small containers of tzatziki and hot sauce, which I promptly dumped on top of the whole concoction. The website did not let me down when it touted its tasty sauces. The cool, lemony flavor of the tzatziki sauce complemented with the lightly spiced, drier lamb meat perfectly. The hot sauce packed a perfect level of heat for me, and was especially invigorating mixed with the rice. The seasoned rice absorbed a lot of the lamb’s flavor, and the small salad provided a welcome break from the hearty meat and rice. All around the meal was satisfying and delicious, kudos to Mrs. Gussy for her secret tzatziki recipe. My only complaint was the amount of sauce I was provided. I could have dumped three containers of tzatziki on the platter and still wanted more. So my suggestion to you would be to ask for extra sauce, after all they are labeled as free on the menu. To order from Uncle Gussy’s, click here . In recent years food has become as trendy as various fashions, seasonally going in style and after time, drifting away into the recesses of our bellies, not to be thought of again. Whether it be cupcakes, super fruits or bacon, food crazes have become widespread with real implications in the food industry. Food trucks have capitalized on these fads in recent years, adding innovative elements of traditional cultural recipes to create contemporary twists on new ethnic dishes. Nationwide these mobile vendors are breathing new life into the industry, from Korean tacos in California to new express French food. Food trucks have all the resources at their disposal to create truly unique cuisine, and have been a staple in New York’s lunch scene for many years. While street vendors may have traditionally started selling hot dogs or mixed nuts, today’s vendors are selling sophisticated and highly stylized dishes with loyal fan followings. Street vendors have largely taken to Twitter to address their customers, alerting them about daily location changes amidst Manhattans sporadically patrolled streets. So what is it about these food trucks that have caught so much attention? The most obvious answer is one you don’t even need to stop and think about…all it takes is a sniff. That’s right; the smell of delicious sizzling meats, tangy sauces and fried goodness suffuses throughout New York’s crowded streets, tempting even the haughtiest of eaters. In fact, food trucks are perfectly engineered to be an efficient lunch time choice based on their simple business model. Their hours of activity always collide with lunchtime, they avoid rent and many overhead costs, employ minimal staff, and the food is guiltlessly designed for the average office worker to pick up and enjoy in the comfort of his own desk. Thus, food trucks are designed to sync perfectly with a New Yorker’s bustling lifestyle. All too often our jobs demand so much out of us that in order to return home at a reasonable hour we forego certain luxuries, namely lunch. Food trucks have found their niche in these workers, not requiring seating for their busy customers who have a choice of parks, steps, or their own desks to eat at. Food trucks don’t solely exist in New York however, and have strong presences in many urban areas. 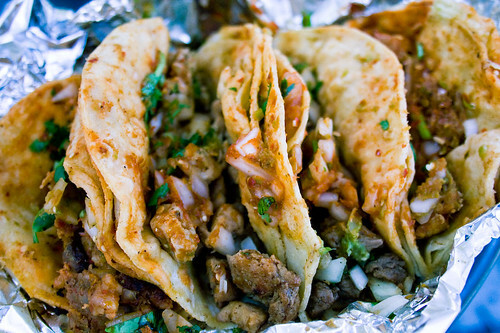 Los Angeles has an enormous food truck community, boasting an estimated 7000 taco trucks alone. Food trucks of different variety exist throughout the United States, such as Hawaii’s sprawling shrimp trucks. The key to some of their widespread success lies in their cultural roots. Glancing at food trucks across the nation, they all offer a taste of culture, homegrown recipes or unique fusion ideas. These cultures vary widely from Belgian waffles to Halal food, yet each promises a taste of something new and exciting. With more Americans opening up their palettes to ethnic foods, food trucks provide an affordable means to sample cuisine that ordinarily one would have to pay upwards of fifteen dollars for at a restaurant. Many of these trucks have been dubbed “specialty trucks”, for the exotic cuisine they serve and for their unique truck designs and catchy names. These specialty trucks tend to roam around their cities more, with a recognizable design for their loyal customer base. They garner special attention for their elusive, unique offers, and for many customers of these trucks, catching them is a large part of the eating experience. Some of these trucks have come to take on a legendary status, like New York’s Rickshaw Dumpling Truck, or the growing fleet of Kogi trucks in Los Angeles. These trucks involve citygoers in an authentic experience, searching for the trucks, finding somewhere to sit and eat, and then relaying the savory experience to friends and family. Many hip urbanites find a definite charm in these trucks, supporting small business and maintaining an outdoor, anti-establishment feel. In many ways these food trucks respond to an entire generation who grew up on junk food, casting aside the pretenses of five star restaurants for a truly satisfying and affordable meal. Food trucks serve a wide range of Americans, and gain new followers every day. Their mobile nature allows them to achieve immense profitability, while continually pushing the limits on their exotic food. Though they have been increasingly pushed out of popular areas by police pressure, rest assured that their Twitter feeds will keep you in the loop; and as long as we continue to salivate when we catch a scent from blocks away, there will always be a place for food trucks in our cities. Food trucks can draw a lot of attention very quickly, through flashy designs, unique food and general word of mouth. However recent police crackdowns have limited their whereabouts and forced many vendors to reconsider their overall strategy. Police are able to relocate food trucks based on a multi-decade court regulation that declared no vendor can sell merchandise from a vehicle parked in a metered space. For food trucks, this means that at a whim they can be ticketed and forced to move from a location they might have frequented for several years. While trucks are subject to these regulations, food carts manage to sidestep this archaic law because they can sell food from right on a sidewalk. What does this mean for the average New Yorker? Your favorite breakfast carts, halal meat carts and other smaller vendors will be on the same streets you’ve always remembered them. For food truck owners this means they have an important decision ahead; evaluating the worth of scrapping the truck for a cart. Several trucks, including the well-known Wafels & Dinges have already adopted this strategy. I’ve decided to list some pros and cons of the food cart, granted that the ultimate decision will be based on the culture and working structure of each individual vendor. Let’s just hope more carts and trucks don’t start clashing for space like they’ve started too around the country.